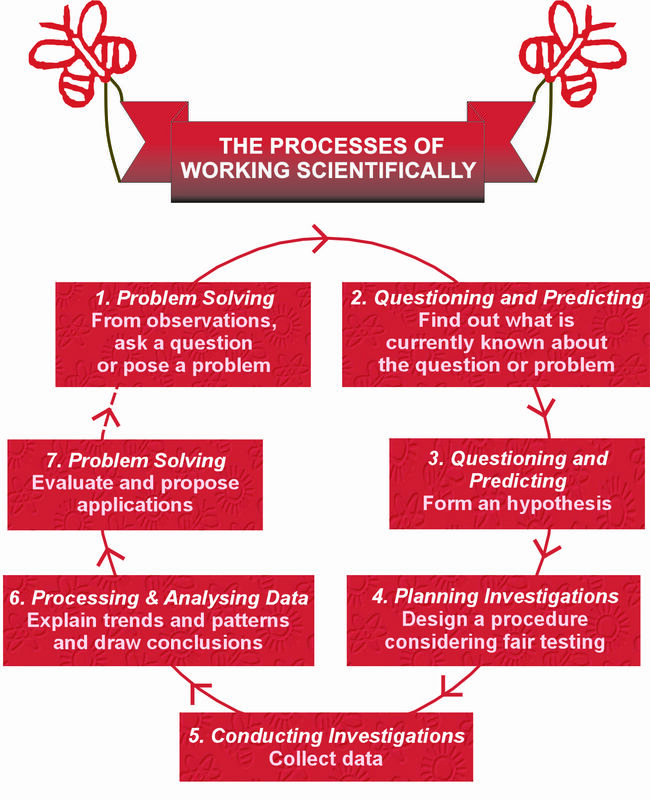 By conducting a scientific investigation, you are fulfilling many science inquiry skills from The Australian Curriculum: Science and implemented in the NSW Science K-10 (incorporating Science and Technology K-6) Syllabus. The emphasis of the NSW Syllabus is using science inquiry to develop science knowledge and understanding, achieved through the processes of Working Scientifically. As you refine your idea and conduct your investigation, you should provide written and/or photographic evidence, in your logbook, that you have closely followed the processes of Working Scientifically, as sequenced in the adjacent flow diagram. It is important that you do not commence experimentation until you have completed the Planning investigations stage as you must show evidence of a risk assessment, including an explanation of how you intend to minimise potential risks. The Young Scientist Committee have produced a special Human Subject consent form that needs to be checked and signed by your school ethics committee before you commence experimentation. For the Young Scientist Awards, your scientific investigation must be presented electronically as a formal report. You are to also submit a logbook electronically. You may also submit a poster or video or any other component electronically that enhances the quality of your entry. Introduction – The story behind your idea and the reason for doing your particular investigation. Aim(s) – One or a few sentences that clearly state what you are trying to find out. Background Research – Before starting your project it is important to find out what other research has been done on your topic. Collect relevant information from libraries and the internet. Talk with others and find out their thoughts on your topic. Hypothesis – Based on what you already know and the information gathered from your background research, formulate your hypothesis. Your hypothesis is your predicted ‘guess’ and it must be able to be suitably tested. Risk Assessment – Identify and list the risks associated with your investigation. State how you intend to minimise each risk. Consult your school’s ethics committee if your research involves animals, humans or hazardous chemicals. Experimental Variables – Plan how to conduct a fair test – where one variable (independent variable) is changed while all other variables are kept the same. Method – A step by step procedure showing how your experiment was performed. Include the materials and equipment used and perform at least three identical trials. Results – Organise your data into tables and/or graphs so your findings are clearly displayed. To demonstrate something has physically changed, include before and after photos, if relevant. Data Analysis – Identify trends, patterns and relationships in your data. Perform simple or complex statistical analyses of results. Discussion – Comment on your results, highlighting new findings or sources of error. Conclusion – Include a short statement indicating whether your results do or do not support your hypothesis. Further Research – Based on your findings, what is your next step? Are there further applications to your research? Note: You must acknowledge any assistance you were given and cite all references used in full.